Like a number of other ethnic groups in the Middle East, such as the Kurds, the Druze live in several different countries, separated by borders drawn after the breakup of the Ottoman Empire in the early 1920s. But unlike the Kurds, who are largely Muslim, the Druze are a unique religious and ethnic group. Their tradition dates back to the 11th century and incorporates elements of Islam, Hinduism and even classical Greek philosophy. Today, 1 million-plus members of this community live primarily in Syria and Lebanon and, to a lesser extent, in Israel and Jordan. In Israel, the Druze are a close-knit community active in public life, according to a new Pew Research Center study of Israel. They make up roughly 2% of the country’s population and most live in the northern regions of the Galilee, Carmel and the Golan Heights. 1 Nine-in-ten Israeli Druze say they have a strong sense of belonging to the Druze community and about the same number (93%) say they are proud to be Druze. Roughly two-thirds say they have a special responsibility to take care of Druze in need around the world. About seven-in-ten Druze (72%) say their religious identity is very important to them. But when asked if their Druze identity is mainly a matter of religion, culture or ancestry – or a combination of these elements – roughly eight-in-ten say being Druze is either essentially about ancestry or culture (33%) or a combination of religion and ancestry/culture (47%). Only about one-in-five say being Druze is primarily a matter of religion (18%). By comparison, more Israeli Christians (31%) and Israeli Muslims (45%) say being Christian/Muslim is mainly a matter of religion to them. 2Israeli Druze rarely marry across religious lines. In our survey, fewer than 1% of married Israeli Druze say they have a spouse or partner from outside their religion. This mirrors other religious groups living within the country; only 1% of married Muslims and Christians and 2% of married Jews say their spouse belongs to another religion. For Druze in particular, this lack of religious intermarriage may also be a reflection of the community’s history. Since just after its founding in the 11th century, the Druze tradition has been officially closed off to outsiders and proselytism has been prohibited. Since that ban, the Druze population has continued to exist solely based on the continuation of its previous generations. 3The Druze place heavy emphasis on philosophy and spiritual purity. Nearly all Druze (99%) believe in God, including 84% who say they are absolutely certain in their belief. But there are no set holy days, regular liturgy or obligations for pilgrimage, as Druze are meant to be connected with God at all times. A quarter of Israeli Druze say they attend religious services at least weekly (25%) and a similar share say they pray daily (26%). Druze tradition also honors several “mentors” and “prophets,” including Jethro of Midian (Moses’ father-in-law), Moses, Jesus, John the Baptist and the Prophet Muhammad. Several philosophers and other influential people are also held in high regard by the Druze, including Socrates, Plato, Aristotle and Alexander the Great. 4In Israel, the Druze are active in public life and subject to the military draft. In fact, for more than four decades, the Israeli military had a primarily Druze infantry unit called the Herev, or sword battalion. This is in contrast with Israeli Arabs, who are exempt from military service. About six-in-ten Druze men included in our survey say they have served (45%) or currently are serving (15%) in the Israeli military. Druze women are not required to serve. Among Israeli Jews, 75% of men and 57% of women currently serve in the military or have served in the past (Israeli Jewish men and women are required to serve, with some exemptions). 5The Druze and other Israeli groups share similar assessments of the possibility of a two-state solution to the Israeli-Palestinian conflict. While 42% of Druze say a way can be found for Israel and an independent Palestinian state to coexist peacefully, 51% of Muslims, 45% of Christians and 43% of Jews also take this view. About a third of Druze (32%) say “it depends,” when asked about prospects for peaceful coexistence. Just 18% of Druze say a two-state solution is not possible – a lower share than among Muslims (32%) and Jews (45%) in the country. 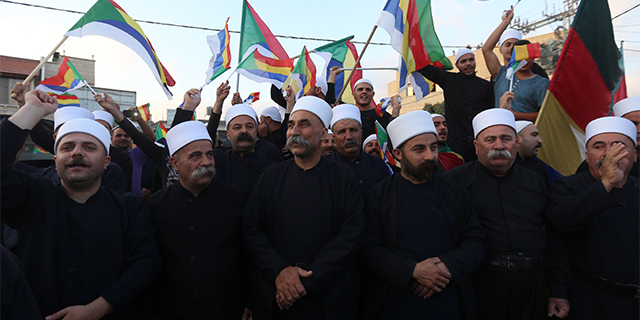 Pew Research Center received helpful guidance on the Druze from Alexander Henley, American Druze Foundation Post-Doctoral Fellow at the Center for Contemporary Arab Studies at Georgetown University.